Publication History: This article is based on Chapter 7 of "The Log Analysis Handbook" by E. R. Crain, P.Eng., published by Pennwell Books 1986 Updated 2004 and 2016. This webpage version is the copyrighted intellectual property of the author. "Slowness" is the new word for sonic or acoustic travel time. The inverse of slowness is speediness or velocity. We continue to use travel time in this Handbook - it's hard to teach old dogs new tricks. 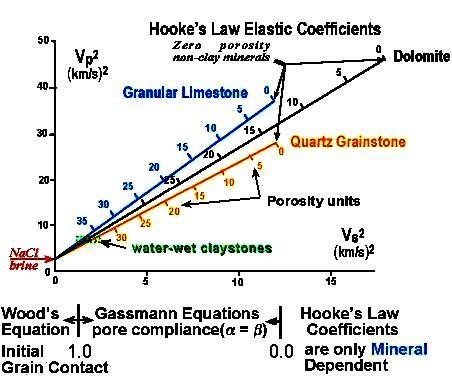 Since density and the moduli vary with the rock mineral type, shale volume, porosity, and the type of fluids in the pores, so does velocity. Travel time is the inverse of velocity, so it varies with these components as well. M. R. J. Wyllie plotted core porosity against travel time and found a linear relationship that varied in slope depending on mineralogy. Later a shale term was added. At low to medium porosity, a plot of velocity versus core porosity also appears to be linear, but the square root term in each of the above equations suggests that either arrangement should be a curve. Wyllie's linear approximation is sufficient for many situations and is very widely used. The response equation is not rigorous and many exceptions are noted below. 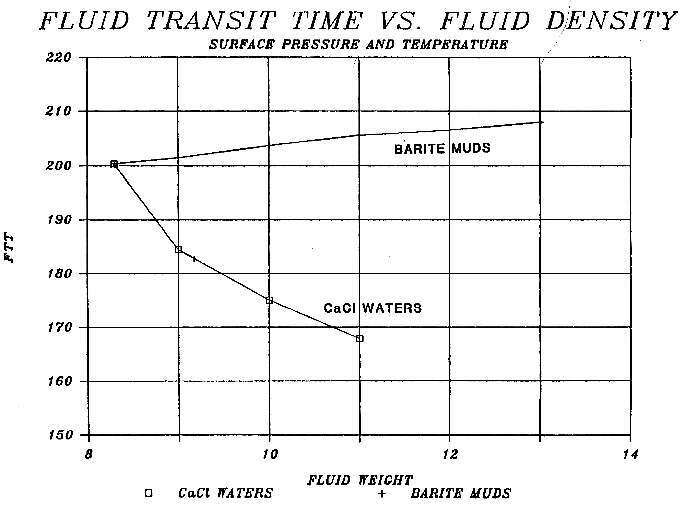 Mineral and fluid parameters are shown HERE. 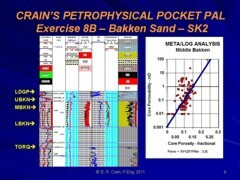 Shale properties are selected from the log in an obvious shale zone. 6: IF SONICGASSWITCH$ = "ON"
Of the three "one-log" porosity methods, the sonic corrected for shale is the preferred one for wells drilled after 1957 and before 1965. 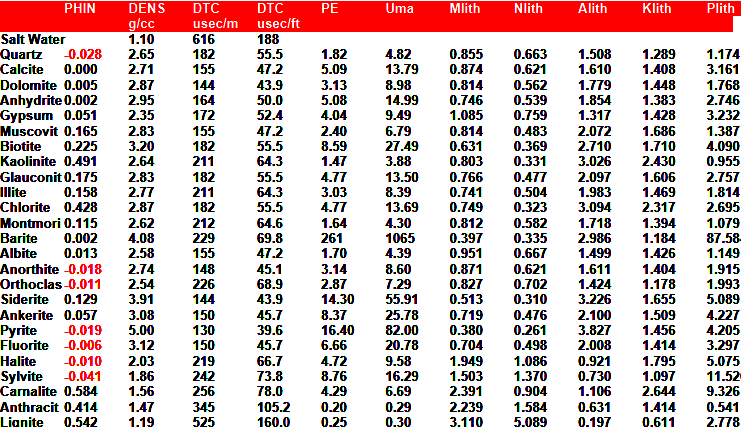 However, crossplot methods or the density log corrected for shale are usually better if the log data is available. The graphical solution for these formulae is provided below. Simpler charts exist which do not include the shale or fluid correction. If any significant amount of shale exists, do not use simple charts. Use the compaction correction only if CDTSH > 100 (for English units) or CDTSH > 328 (for Metric units). In western North America, this is normally required when above 3,000 - 4,000 feet (900 - l,200m). KS is in the range 0.7 to 1.0 depending on gas density invasion and local experience. It can be derived by comparing the calculated porosity with the true porosity from cores or density neutron crossplot methods. Use gas correction only if PHIS is too high compared to other sources, only if the zone is clean and does not need shale corrections, and if gas is known to be present. The need for this correction is rare. It is very unlikely that a gas correction will be needed in shaly sands since invasion should be relatively deep. Another way of making gas corrections is to change DELTW to a higher value, representing the travel time of sound in a mixture of gas and water. This value depends on water saturation in the invaded zone, pressure, temperature and gas compressibility. Values in the range of 600 usec/ft (1900 usec/m) at shallow depths to 300 usec/ft (950 usec/m) at 6000 feet (2000 meters) are recommended as a starting point. Therefore compaction correction is not needed. PHIsc is not too high, and no gas is known to be present. Hence, no gas correction is made. No gas correction is required. No shale correction is required. The acoustic wave from a sonic log travels in the rock near the wellbore face. The pores contain mostly mud filtrate with some of the original formation fluids (formation water with or without oil or gas). We generally assume DTCW = 656 usec/m for fresh water mud filtrate and DTCW = 616 usec/m in saturated salt water mud filtrate (200 usec/ft and 188 usec/ft respectively, in English units. However the chart below show that DTCW could be as low as 168 usec/ft in a saturated CaCl mud system. Some mud systema use KCl to reduce shale erosion. These are still relatively fresh water muds compared to saturated CaCl muds, so the DTCW will still be close to, but less than, the fresh water value. Mud sytems with seawater makeup have a salinity of 20,000 to 30,000 ppmso DTCW should about 10% less than the fresh water value. Saturated NaCl mud may be used while drilling through salt beds, so the lower limit of DTCW should be used as a starting point. Barite weighted muds are usually an emulsion with fresh water and DTCW varies only slightly wih mud weight. In oil base muds, invasion is seldom an issue so DTCW depends on the salinity of the formation water and the hydrocarbon density. All of this means that you may need to tinker with DTCW, as well as matrix and shale terms, to help get a good calibration to core porosity. A graphical solution for the Hunt-Raymer method, with no shale correction, is given in BELOW. - Shale Corrections Are Required Before Using This Graph. Although the original paper does not discuss shale corrections, they are essential. Gas corrections similar to those used in the Wyllie method can be used if needed. The answer porosity will be too high in gas if the corrections are not made. The method is not universally applicable and should be tested in each area before use. Porosity is too high due to gas effect - assume KS = 0.80. This result is a little high compared to the more conventional method. The newer sonic logs record shear travel time as well as the compressional travel tine. The compressional data is processed as discussed above under the Wyllie and Raymer-Hunt methods. Shear travel time can be used in the Wyllie equation, using fictitious values for fluid travel time. There is very little fluid effect on shear data so there is no gas correction. Shear travel time is more sensitive to porosity than compressional data. No gas correction is needed. The measurement can usually be made through casing so this is a good choice for cased hole logging. There is no record of a compaction correction being applied, but this may be needed. Comparison to core porosity or density neutron crossplot porosity will indicate when such a correction is needed. Beta (Biot coefficient) is for the calculation of bulk modulus, BetaS (Gassmann coefficient) for the calculation of the Shear modulus. Beta and BetaS are not necessarily equal. 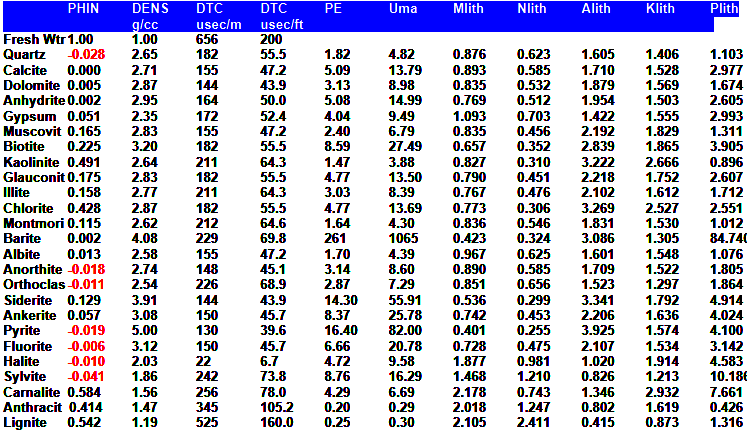 BetaExp and BetaSExp are coefficients which may be called Biot-Krief exponent and Gassmann-Krief exponent. This set of four non-linear equations must be solved for PHIt in terms of Vs^2 and Vp^2. Probably the solver in Excel will do it, but I haven't tried it. By using volume weighted averages of shale and matrix rock properties for the matrix terms, you can replace PHIt with PHIe. Kf can be set to account for gas, oil, or water. A graph showing the result for clean rocks is shown below. slope of lines steepens slightly. Porosity scale on the lines stretches a bit but matrix points do not move.